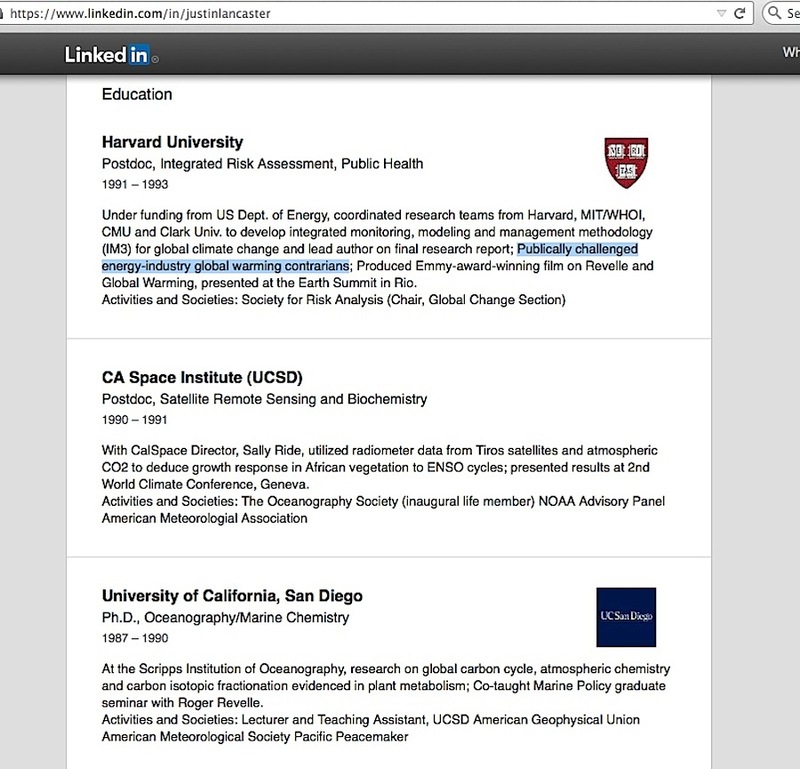 It’s a major problem that the ‘industry-corrupted skeptic climate scientists are paid to lie‘ accusation has no evidence to support it, but now it appears the person widely credited with ‘discovering/exposing’ that corruption is seen with significantly conflicting dates of when he actually started examining skeptic scientists. 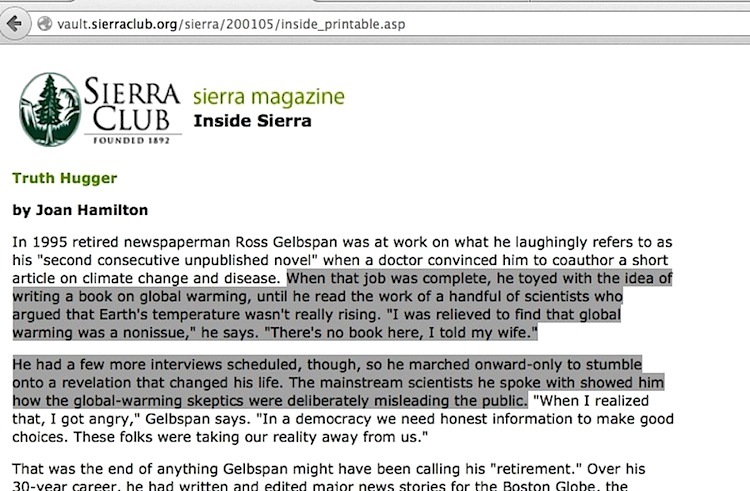 Ross Gelbspan, ever since late 1995, has claimed skeptic climate scientists received industry money in exchange for knowingly spreading misinformation about global warming. 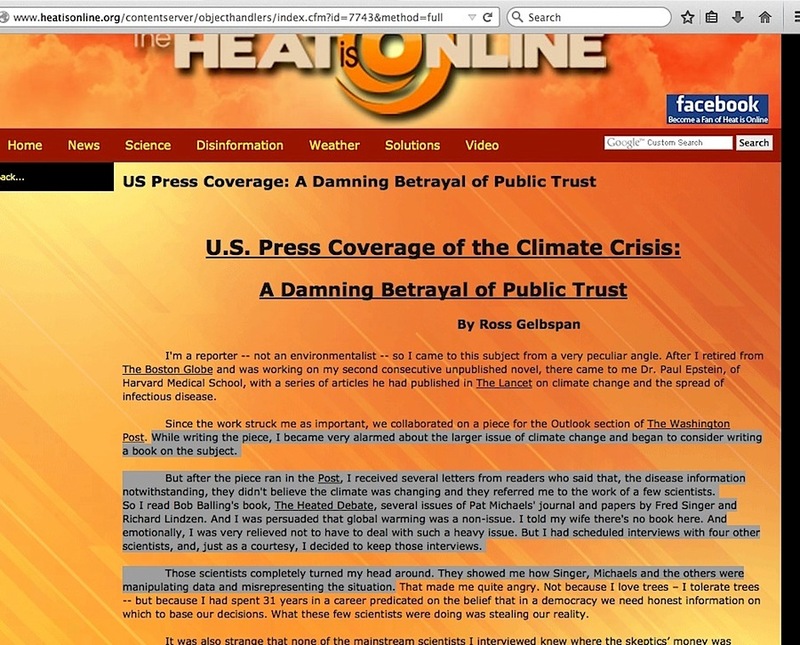 He has repeatedly cited a leaked Western Fuels Association PR campaign memo, insinuating its strategy to “reposition global warming as theory rather than fact” proves their guilt, and my work details how that memo phrase never was the top-down industry directive he portrays it to be, along with other troublesome credibility problems he faces. One of those other problems involves his claim that he was totally unaware of how skeptics were corrupted until a situation in early 1995 surrounding his involvement with a ‘mainstream’ scientist led him to tell a highly unflattering story of those skeptics. In some retellings, he mentions skeptic scientist Dr S. Fred Singer in a way that suggests he’d never heard of Singer before. However, his narratives about that situation are inconsistent, as I described in my older blog posts here, here, and here. Gelbspan also seems to have a ‘start date’ problem. 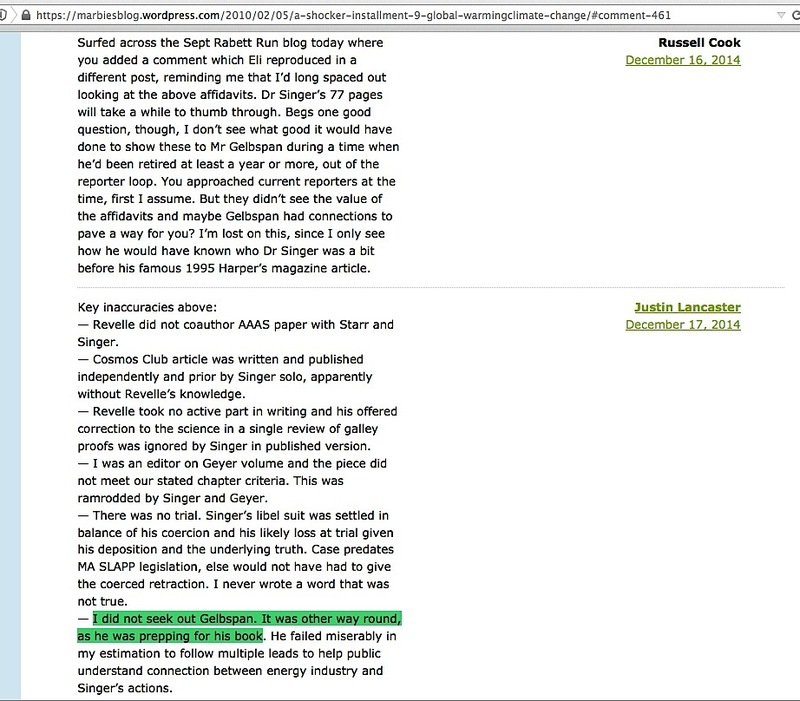 In my December 16, 2013 blog post, I pointed out a pair of situations which are inconsistent with his publicly proclaimed 1995 start date as the time when he began digging into ‘corrupt skeptics’. I knew of one other inconsistency in December 2013, which now becomes the topic of today’s blog post. Before this other inconsistency can be explained, I must first provide the following simple setup (told in greater detail at Mark Sheppard’s 2006 “Gore’s Grave New World” article). 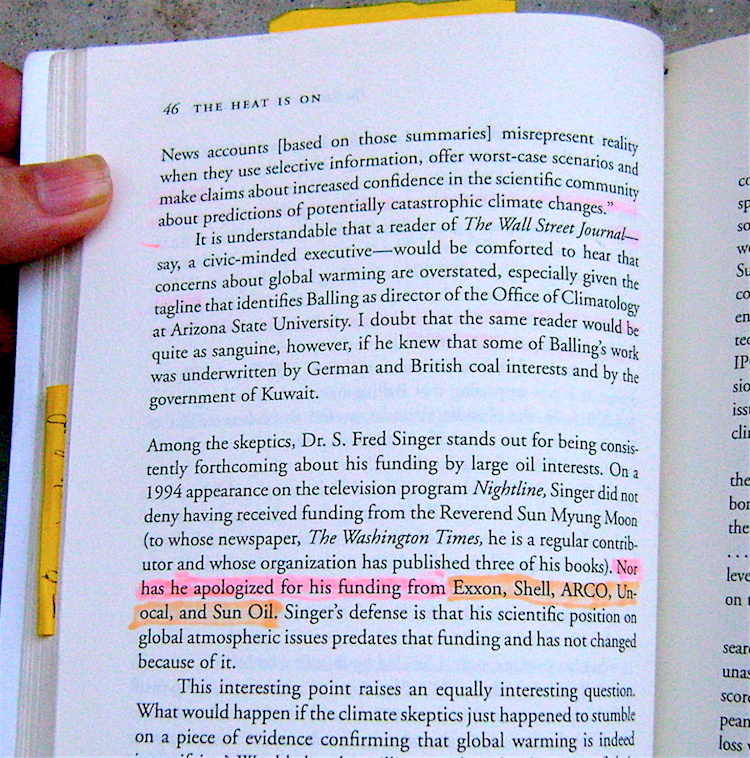 In his 1992 “Earth in the Balance” book, Al Gore refers to his Harvard professor, oceanographer Dr. Roger Revelle, as an inspiration to pursue global warming mitigation efforts. However, not long before Gore’s book was published, Dr Revelle had reversed his views on the dangers of carbon dioxide, and they were seen in a paper he co-authored with atmospheric physicist Dr. S. Fred Singer and physicist Dr Chauncey Starr. 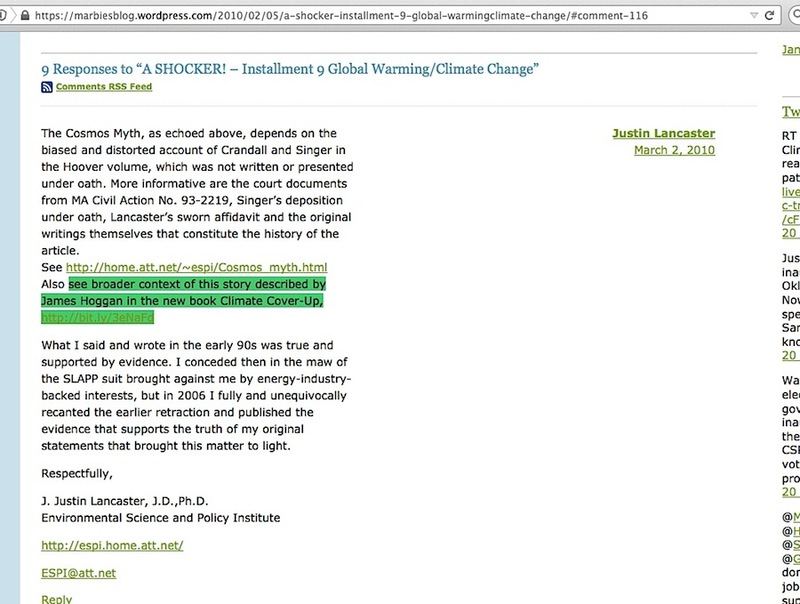 Dr Revelle’s former associate Justin Lancaster, after receiving a phone call on the matter from Al Gore, accused Dr Singer of basically forging Revelle’s name on the paper, and the resulting libel lawsuit filed by Dr Singer turned in his favor when Lancaster retracted his accusation. 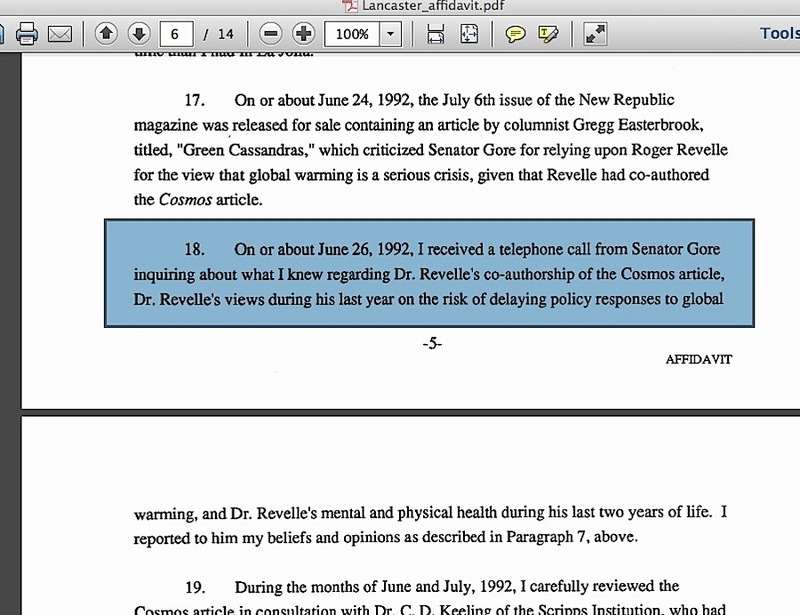 During the deposition process of Dr Singer (full text here), Lancaster acted as his own attorney, posing most of his questions on the Revelle-Singer-Starr paper and related science points, but closed with questions about skeptic climate scientists and Western Fuels’ funding of them. 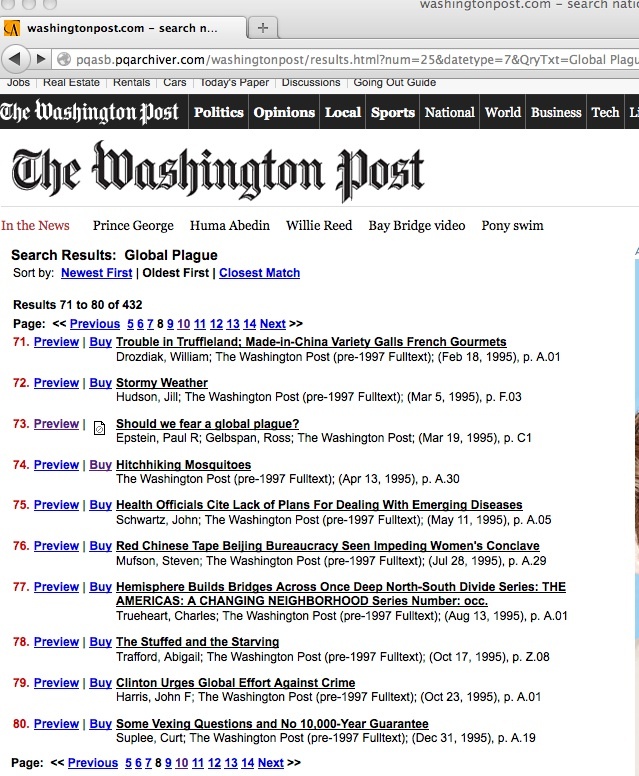 … I presented all this information to Mr. Gelbspan close to the time of settling the lawsuit, well in advance of his 1997 book…. 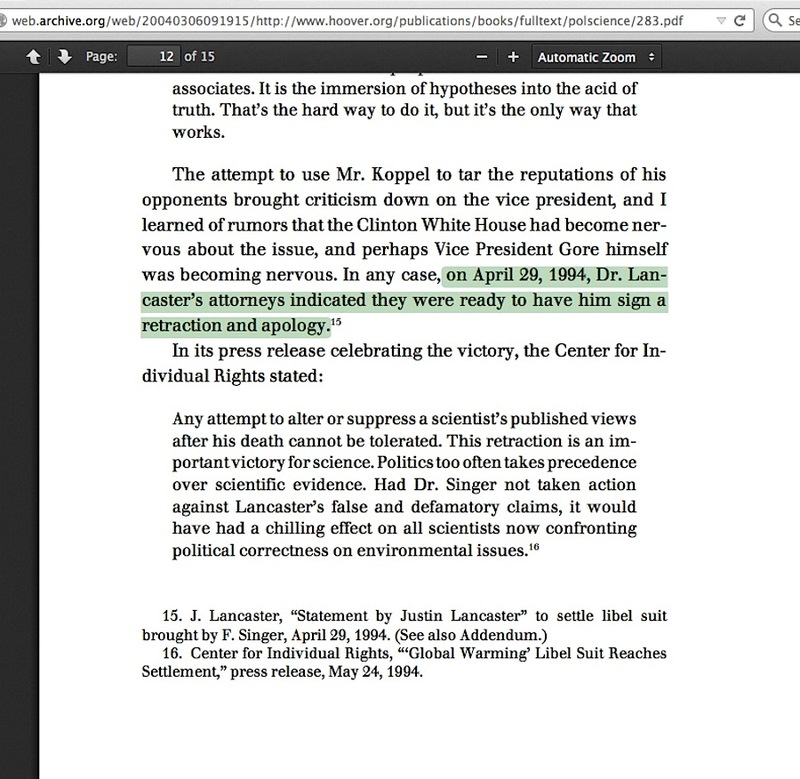 Dr Singer’s account of the lawsuit says (on page 12 here) “… on April 29, 1994, Dr. Lancaster’s attorneys indicated they were ready to have him sign a retraction and apology…” which settled the lawsuit. ‘Close to the time of settling the lawsuit’ could be interpreted two ways, the time somewhat before before the settlement, or after. Wouldn’t most people describe it as being “right after the settlement” if it was the latter situation, though? There is the ‘start date’ problem. 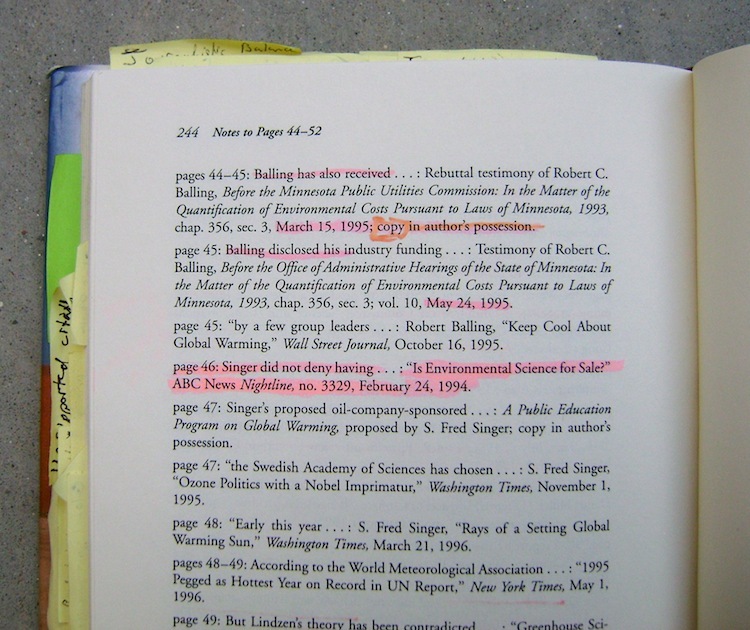 Gelbspan’s version of the events sequence leading him to discover the ‘corruption of skeptic scientists’ has him co-authoring a global warming article with a scientist in early 1995, becoming alarmed enough at the scope of the issue to consider writing a book about it, becoming so relieved after reading works from Dr Singer and others that he dropped the book idea, and then discovering that such skeptics were industry-corrupted liars. All within a span of weeks. In 1995. Dr Singer’s statement carries just as much significance as if he’d said he consulted for Greenpeace or a local historical society. Without evidence that the consulting fees changed previously held viewpoints of his to new ones that were lies and fabrications, his statement does not prove a sinister conspiracy exists between people like him and industry executives. And Lancaster asked no questions about corrupting influence. 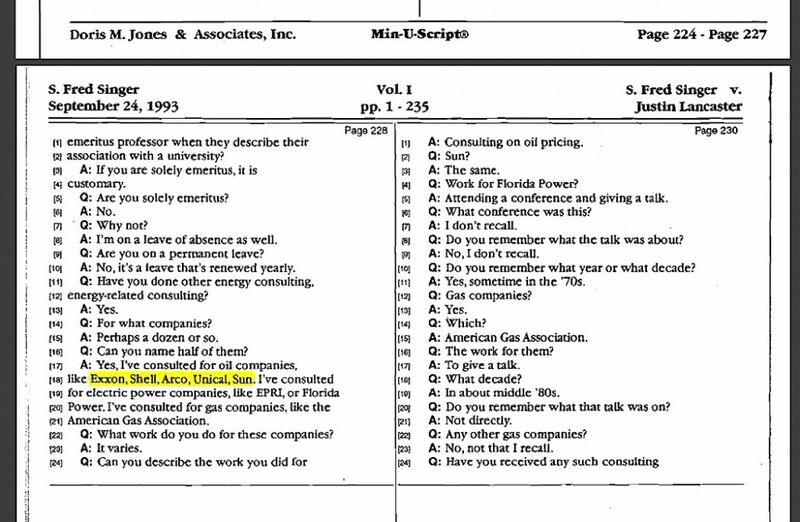 Despite its sheer weakness of guilt-by-association, the exact oil company lineup Gelbspan recited back in 1997 has still gotten quite a bit of mileage. Some cite Gelbspan directly for it. 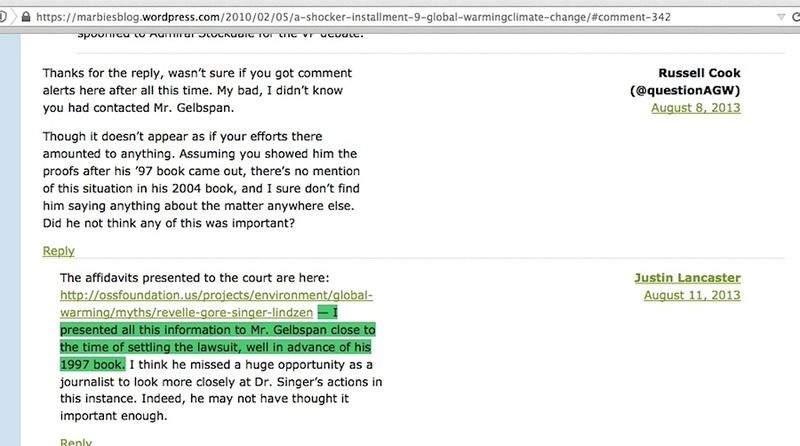 So when Lancaster lamented in his last comment to me “I think he missed a huge opportunity as a journalist to look more closely at Dr. Singer’s actions“, it looks instead like Gelbspan exploited the opportunity of Dr Singer’s “Exxon, Shell, Arco, Unocal, Sun” words for all it was worth. 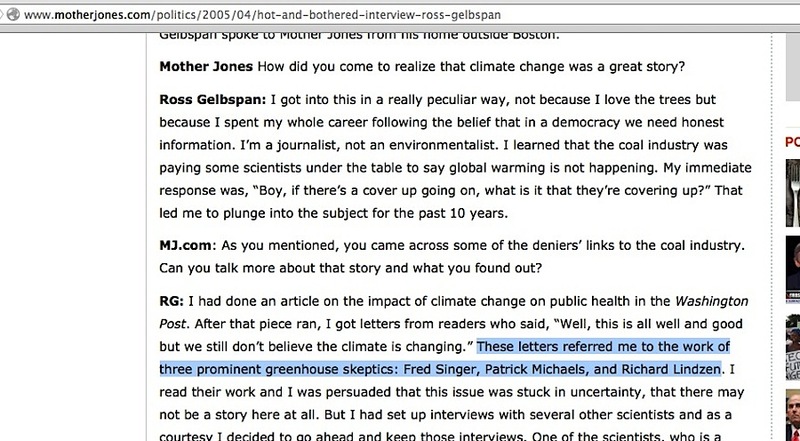 One could say Gelbspan used those as a launching pad, since he actually first mentioned them in his December 1995 Harper’s magazine article, which was itself a launching pad for his 1997 “The Heat is On” book. The measure of good science is neither the politics of the scientist nor the people with whom the scientist associates. It is the immersion of hypotheses into the acid of truth. 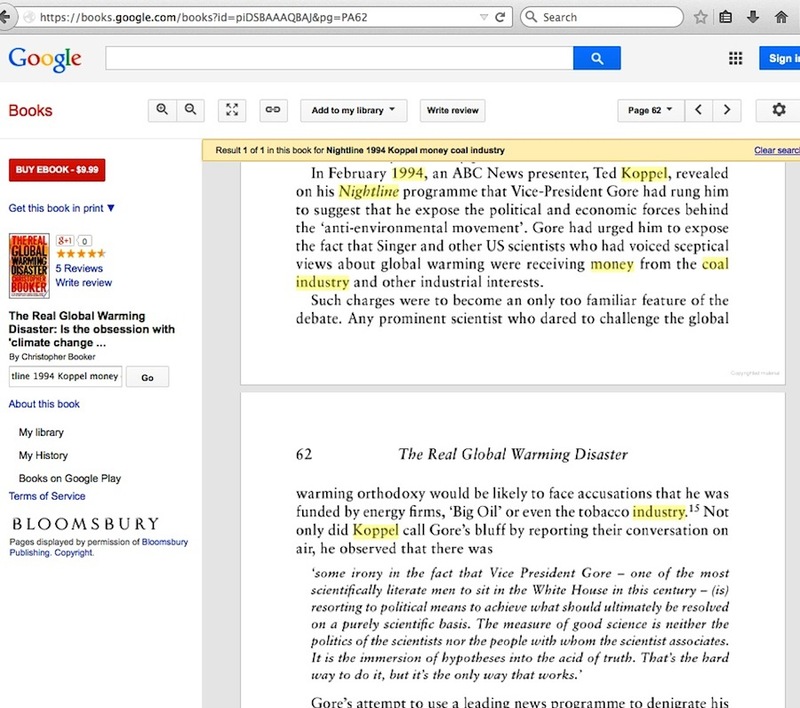 Al Gore and his followers have tried to prevent this ‘immersion’ from happening by steering the public into believing skeptic scientists were paid to lie, and they found their best success with that tactic under the guidance of Ross Gelbspan and his exploitation of the “reposition global warming” phrase as a sinister ‘big coal & oil’ industry directive. But everything surrounding this effort collapses under hard scrutiny. Everything. 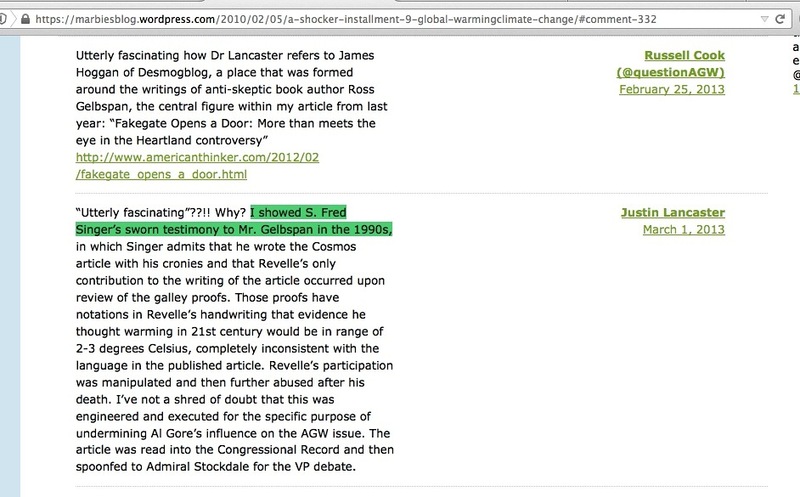 What happens if reporters or congressional investigators ask Lancaster (a Harvard post-doctoral climate modeler at the time) how he knew to ask so many narrow questions about Western Fuels’ associations with skeptic climate scientists, and if he was aware of evidence proving the associations corrupted those skeptics? This entry was posted in Discovery odyssey and tagged ABC News, Justin Lancaster, S. Fred Singer by Russell Cook. Bookmark the permalink.